Technically this wasn't a daytrip - this activity lasts three days but I commuted the 20 miles each way from my sister's place. 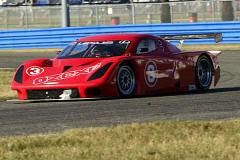 The Rolex 24 Hours of Daytona runs the first weekend in February. Since this is the first race in the Grand American Racing Series, the first weekend in January is set up as a test weekend for all the competitors. Here is where all the new cars hit the asphalt for the first time and the sorting out starts. This particular test weekend, I am the only one representing Hella. My job is to contact all the team managers and find out what they need. Of the 55 teams here this weekend, some 45 are running Hella lights. Some are Hella from the factory, such as the Porsche GT3 RS and Cup cars, some are Hella by design, such as the Daytona Prototypes, and some are Hella by add-on or by modification. The only people at the track are the teams, some vendor representatives like me, and a very few of the professional media. This is not a public event, so the public is not invited - there are no spectators, no crowds. This is a working weekend for the teams to sort out the cars and for the drivers to familiarize themselves with the cars and the track. Security is light and I've signed a substantial risk waiver so I pretty much have the run of the place. A Ferrari 360 Modena. This particular car is in the GT class and is loosely based on the stock version - substantial performance modifications are allowed. All GT class cars are based on a currently manufactured street car. You'll also see the Porsche GT RS, the Maserati GT, a lone BMW M3 and some Corvettes running this class. 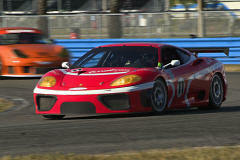 This particular Ferrari is run by JMB Racing. 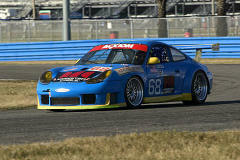 This is one of the Porsche GT Cup cars. This runs in a new class, the SGS class. I'm not really sure what that might be, but the cars in the class are very close to the stock version - few modifications are allowed. You'll also see some Corvettes in this class. 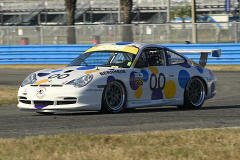 The Porsche GT Cup is the same car running in the Porsche Cup series in Europe. This one is run by Team Vision. So there you have the three classes - from the fastest, DP, to GT, the middle class, and SGS, the slowest class. Having a mix of technologies and capabilities on the track all at the same time does make for some interesting, and sometimes unpredictable, racing. 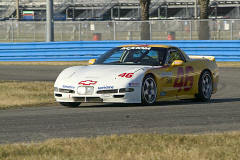 This Corvette is running in the SGS class. This one is run by Michael Baughman Racing. Another DP car. This one is built by Bill Riley (think Riley & Scott) and runs a Pontiac engine. You can see that no matter how they try, the designer just can't do much with the specs they have to work with - another plug ugly car. 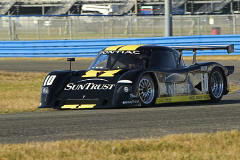 This one is run by SunTrust Racing. By now, you should be able to pick out a DP car. This one is built by Multimatic and runs a Ford engine. This car is entered and sponsored by Mears Motor Coach. The spec is the same, the aerodynamics are a little different, but it's still ugly. The lone BMW entry. 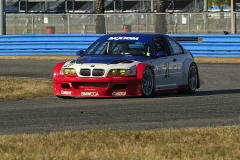 This M3 is entered by PTG, Prototype Technology Group. 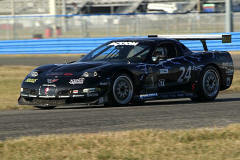 The drivers are Bill Auberlen, Boris Said and Justin Marks. The sponsor is BMW Financial Services. This is a Porsche GT RS. In the GT class, this car is entered by the Racers Group and is sponsored by Monster Cable. Kevin Buckler, the owner of Racers Group, has five cars entered this year. Kevin is one of the drivers in one of his cars and for the most part, he sells rides in the rest of them. A car in the 24 Hour may have 3-4 drivers. 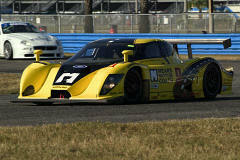 This car won the Daytona 24 hour race last year. Apparently the organizers were so embarrassed with a lowly GT car beating their spec "faster" DP cars, they changed the rules for this year. This year, all GT cars have to run with a fuel tank 20 liters smaller than last year. We figure that in 24 hours that's 12 more pit stops for fuel. I'm not sure I understand the philosophy here - if the spec car is a slug (speed and cosmetically) don't change the spec to improve the car, hobble the competition. There are no factory Corvettes running this series but this looks suspiciously like one of the factory Corvettes built by Pratt & Miller for the American LeMans series. I suspect this is one of the old factory cars bought by a privateer. In this case, the entry is Specter Werks and the sponsor is Cauley Chevrolet. It is in the GT class. Another Ferrari 360 Modena. 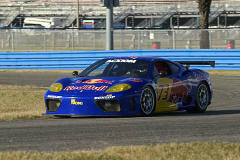 In the GT class, this one is entered by BE Racing and is sponsored by Red Bull.